What Is It Like to Have Parkinson's? John B. King is a painter and owner of Hudson Valley Homestead, which manufactures gourmet products such as Bushwhacker's Savory Sauce, mustards, dressings, vinegars and blended herbs. He currently lives in the Hudson Valley and was diagnosed with Parkinson's on Valentine's Day 2005. "King's writings and pictures touch me deeply with their concise, heart-touching language and poetic imagery, and such perfect paintings on each page, not only the final page with the Monet-like realistic nature scene, but each of the abstract 'energy-images.' King has done a beautiful job with this book." "King's reflections on Parkinson's give me a new and clearer understanding of how PWPs feel, and the daily challenge my husband, Don, faces. The book is very insightful, moving, humorous and true." 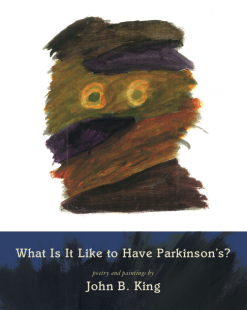 "The images King has painted and associated with his words conveys a sensibility about living with the challenges of Parkinson's disease that is staggeringly truthful and courageous. King inspires me to do my best to support and educate communities about PD and so, in some small way, 'ease the burden' PD imposes on folks like him."